For the third time in six seasons, the Blackhawks can call themselves Stanley Cup champions. With their impressive 2-0 shutout victory over the Tampa Bay Lightning on Monday night, the Hawks have cemented themselves as the greatest NHL team of the salary cap era, and some people are choosing to use the word “dynasty.” Whether or not you agree with that label is a discussion for another day. For now, let’s just focus on how great, fun, exciting, legendary, etc., this team is. The pursuit of this Stanley Cup victory really began as soon as the L.A. Kings knocked the Hawks out of the playoffs last season in overtime of Game 7 of the Western Conference Final. The Blackhawks were one shot, one goal away from advancing to the Stanley Cup where anything could have happened. Instead, they were sent packing far too early for their liking. A bad taste was left in their mouth, and an even stronger hunger left in their minds to get right back to that same spot and change the outcome. They did just that this go around by defeating the Anaheim Ducks in Game 7 of this year’s WCF. Once they reached the Stanley Cup Final just a couple of weeks ago, this team knew that they would not walk away empty handed again. They had too much reason and too much desire to let that happen. Essentially, the Blackhawks knew that they would win the Cup this year, only they’ll never tell us that. As if losing to the Kings last spring wasn’t enough motivation, the Hawks received plenty more of it this year that propelled them to winning a third Cup in six years. They endured one of the toughest regular seasons a team could possibly imagine. Just before Christmas, they lost their assistant equipment manager, Clint Reif, to an all too sudden death. The players and coaches all considered him to be just as much a part of that team as anyone else, and his loss hit the Hawks harder than any of us can imagine. Then not long after, former teammate Steve Montador suddenly passed away, again pushing the players’ emotional capacities to the limit. This team was already on a mission to win the Cup this year to avenge their Game 7 loss last year. 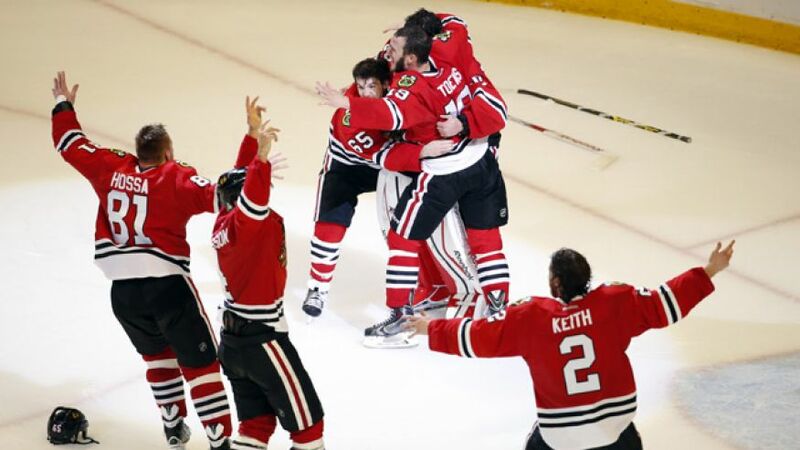 After the deaths of two people extremely close to the team, the Blackhawks were not going to be denied the Cup. They were going to win it for those who would not be there to experience it, and they did just that. Looking back on this playoff run, it’s really amazing to think about how good this year’s Hawks really were. Take this series against the Lightning for example. Jonathan Toews, Patrick Kane, and Patrick Sharp combined for three goals in the series, yet they still won in six games. Contributions were made up and down the lineup to get the Hawks another Cup, whether it was Antoine Vermette, Teuvo Teravainen, Marcus Kruger, Andrew Shaw, etc. This was a true team full of champions, and now, that’s just what they are. 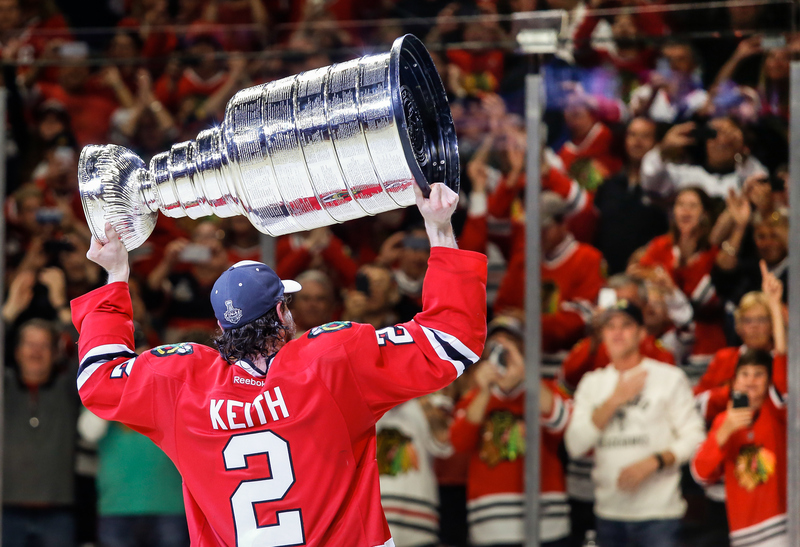 Duncan Keith, the unanimous vote-getter for the Conn Smythe Trophy as the playoff MVP, put together his best ever stretch of play. He finished the playoffs having played more minutes than anyone else, and it wasn’t even close. Keith finished the postseason with close to ninety more minutes than the next closest player, which is astounding. To add icing on the cake, he scored the game winning goal Monday night. And how about Corey Crawford? The guy loses his starting job prior to Game 3 of Round 1, only to get it back for Game 6 and never relinquish it. He closed out the playoffs with a shutout to win the Stanley Cup. Had it not been for his early struggles in the first round, Crawford would have had a strong case to be the Conn Smythe winner. As the seconds ticked down to zero at the end of Game 6 Monday night, it was hard to believe what was happening. For the first time in most of our lifetimes, the Blackhawks were winning the Stanley Cup on home ice in front of their own fans. It was a surreal imagine that I’ll never forget. And although Stanley itself was a little late getting to the party due to sever weather earlier in the evening, it didn’t really matter. The party was on. 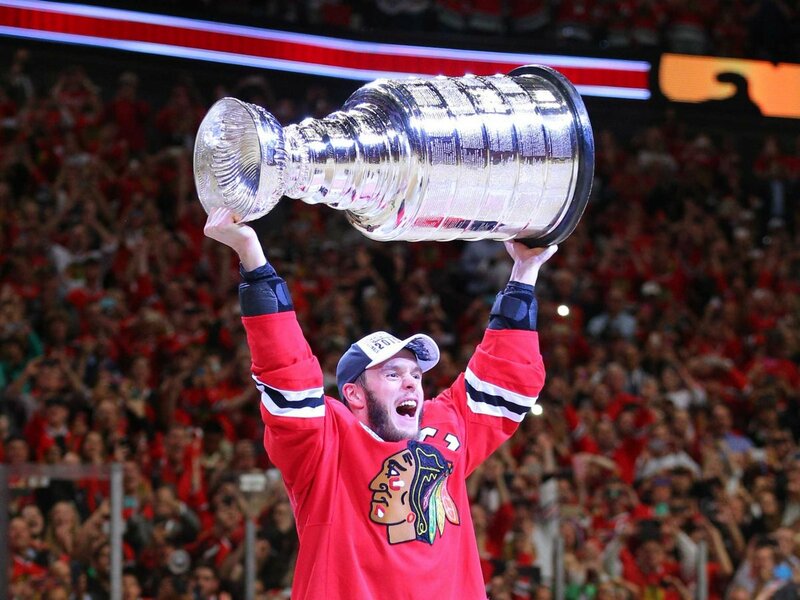 Watching Jonathan Toews accept the Stanley Cup from Gary Bettman for the third time, but the first at the U.C., presumably sent chills down the spines of all of Chicago. 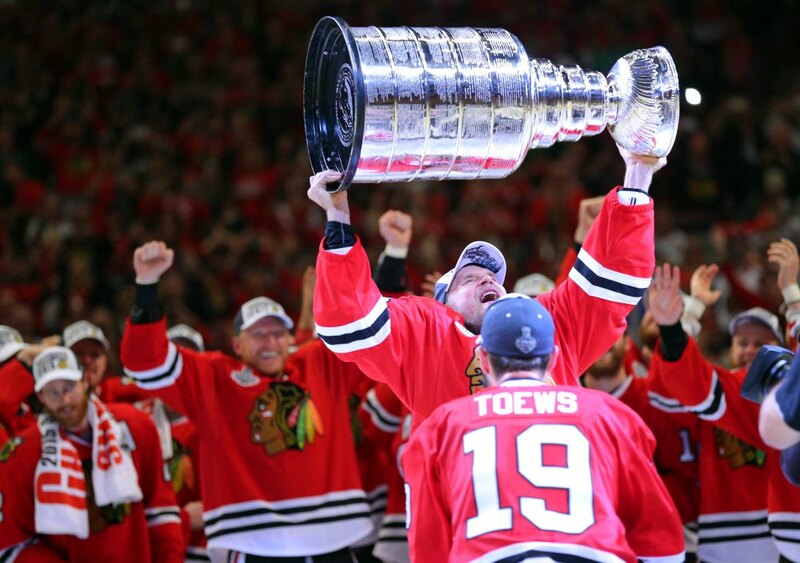 As Toews then passed the Cup onto Kimmo Timonen, it was tears that took over for the chills. A man who nearly lost his life just a year earlier, who had no clue if he’d ever put on another pair of hockey skates, was holding the greatest trophy in sports above his 40-year old head for the very first and last time. It was truly one of the great moments in Stanley Cup history. Joel Quenneville solidified himself as one of the single greatest coaches the sport has ever witnessed, winning his third Stanley Cup as the Blackhawks coach. What’s truly remarkable about Quenneville in all of this is that he has now won the Cup here in Chicago with three different coaching staffs. That is a testament to him and to the men he chooses to stand beside him behind the bench. This year’s Chicago Blackhawks may not have been the best of the three teams they’ve had win the Stanley Cup over the last six years, but they were the toughest. Regardless of what adversity they faced during the regular season and these playoffs, they found a way to overcome it and came out as champions. They started this run five years ago as a bunch of “kids” who were too young and too dumb to realize what they had just done. Now, they are legends who will be looked upon as a modern-day dynasty. For those who just won the Cup for a third time with the Blackhawks, they will forever be the faces of this great organization, and rightfully so. And for a few of them, they’ll be seeing their number hang high above the United Center ice one day, as well as a bronze statue placed outside the stadium for the rest of time. Enjoy this one, as it may be a while until the Blackhawks ever get back to this point due to imminent salary cap casualties. For now though, the Blackhawks are Stanley Cup champions. This entry was posted in NHL and tagged Blackhawks, Blackhawks Stanley Cup, Chicago Blackhawks, Corey Crawford, Duncan Keith, Joel Quenneville, Jonathan Toews, Kimmo Timonen, Patrick Kane, stanley cup by Kurt Schwerman. Bookmark the permalink.